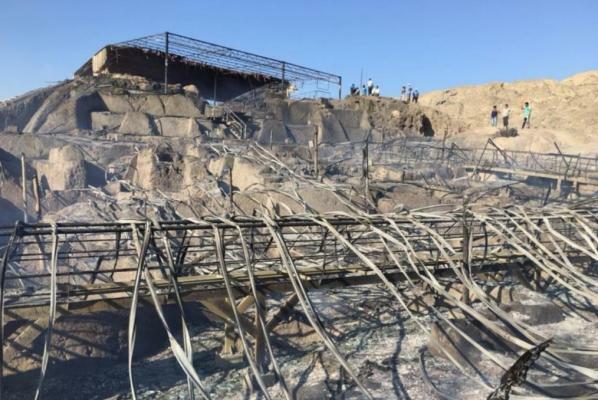 Nov. 14 (UPI) — A fire in northern Peru damaged much of an archaeological site, including a mural more than 4,000 years old, officials at the site said. Officials believe farmers burning sugar cane nearby sparked the fire at the Ventarron archaeological complex Sunday. Archaeologists discovered the mural, carbon dated to 2000 B.C., in 2007 at the 4,500-year-old temple. It depicts a deer caught in a net. Local media reported about 95 percent of the complex was damaged and the mural sustained smoke damage. Pottery and other artifacts were damaged when a plastic tarp covering them melted. Peru’s culture ministry was investigating the cause of the fire. Next article‘Anti-Trump’ hotel set to open in Washington, D.C.